A sugar skull to keep all year long!! Using the link, make the basic skull and mouth and eyes. 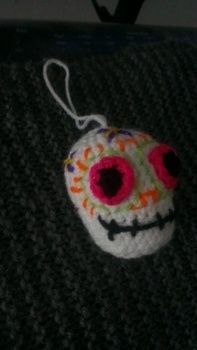 Using wool and sequins etc go to town making the skull as colourful as possible! Enjoy hanging the skull from the rear view mirror, door handles, necklace etc. Make a whole family of them!